Virtual private servers (VPS) have quickly become the preferred hosting solution for small to medium sized businesses around the world. VPS’s help bridge the gap between the limitations of shared hosting and the scalability of dedicated servers, all without the high price tag. A few of the benefits that come with using a VPS include: A more stable hosting environment, dedicated resources, faster load times, greater freedom and control, direct root access, higher bandwidth levels, and you can host as many websites as you want without constraint. Similarly, offshore hosting is another growing trend within the web hosting industry – and for good reason. Offshore hosting providers give you the personal protection and data privacy that mainland companies are unable to provide. Let’s examine the primary benefits of offshore hosting to help you understand why it’s such a smart business decision. Let’s be real. We like to pay the bare minimum for as long as possible. By hosting your website in a country other than your own, usually in a lesser developed country, you’re able to pay significantly less for services that can cost double the price in your own area. This is due to many of these countries paying lower wages, lower taxes, and subsequently lower energy and overhead costs. This translates to offshore host’s not needing as much revenue to sell their services and thus, lower prices for everyone. Many people looking at offshore hosting solutions are doing so to avoid having to pay legal ramifications within their own country. With offshore hosting, the provider does not have to abide by the laws of another country if the law is not in their own. A good example of this is copyright laws. Anyone in the United States selling copyrighted material or trademarked goods can expect to be swiftly slapped with a DMCA notice – or worse. Doing so in the Republic of Maldova or Ukraine, for example, is not technically illegal. So in the end it’s up to the offshore hosting provider to keep a website that contains sensitive or illegal material online. Assume you’re a businessman looking to sell products online to a predominantly Asian audience. If your web host is based in say, South America or southern Europe, you may run into problems. By targeting an area that’s halfway across the world from your own VPS, you can easily run into connectivity issues and experience latency, which can seriously hamper your business’s reputation and profitability. By choosing to house your VPS in a location that’s near your audience, you can expect to experience higher load speeds, and with that, lower bounce rates and higher conversions. Unlike Windows, Linux is a free open source version of Unix. Linux has long been the standard in the web hosting industry due to its reliability, stability, and cost-effectiveness. The Windows operating system, on the other hand, is a proprietary solution created by Microsoft which requires a software license to run on a server. A Windows OS license costs money, which forces many hosting providers to raise the price of their Windows hosting plans to cover the added license cost. In turn Windows OS hosting plans, specifically Windows VPS plans, are difficult to find. This can pose of a problem to programmers and designers proficient in .NET, ASP, and SQL Databases, where working with Windows-specific web technology is a must. But lucky for you, we have you covered. We’ve looked for the best companies providing Windows OS. 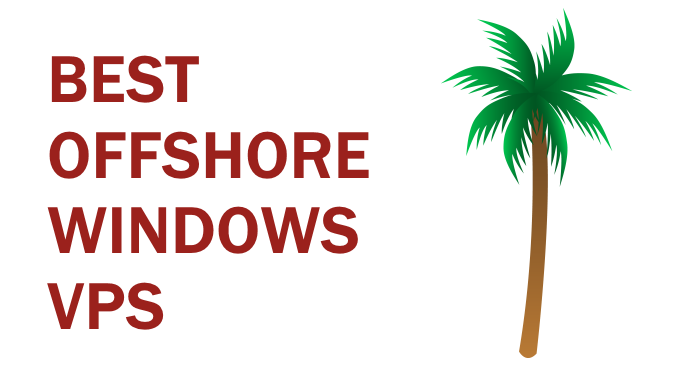 The result is our list of the top 10 offshore Windows VPS providers on the web. UndergroundPrivate was founded in 2012 and is a registered company in Belize. They have server locations in Russia, France, and the Netherlands. Their VPS services are fully-managed and include HDD, SSD, Windows, and bulletproof versions. UndergroundPrivate’s Windows VPS plans run on Russia-based servers and the company ignores nearly all DMCA takedown requests. They offer Windows 2003 and Windows 2008 licenses for free. Their VPS packages feature SAS 15k hard drives and 1 Gbps network ports, all with respect to your privacy. SuperBitHost appears to be relatively new to the offshore hosting industry and is based in Malaysia. The VPS plans applicable with Windows OS run off data centers in various locations, including in Bulgaria, Holland, Germany, Luxembourg, Malaysia, Russia, Singapore, and Switzerland. Any flagged content not found on their Acceptable Use Policy is dealt with according to Malaysian law – which means they do ignore copyright complaints. SuperBitHost’s dedication to privacy is apparent by their accepted payment methods, which include: Litecoin, Bitcoin, and Perfect Money. Windows OS works only on their Germany, Malaysia, and Switzerland servers. They include the following Windows server licenses: Windows 2003 Enterprise Edition, Windows 7 Ultimate, Windows 2008 R2 Standard (64 bit), and Windows 2012 R2. Their prices are decent, but there’s not much information on the type of hardware or data centers the company uses. UnderHost is a employee-owned, all-in-one offshore hosting provider first established in 2007. They claim to maintain their own servers within several data centers across 8 countries. Each Windows offshore VPS includes a free cPanel license and Windows 2012 or 2008 Std R2 license. We like that UnderHost relies on its own hardware and uses the latest hosting technology. A Windows 2012 license is free, which is great, and each VPS can run on Xen or Hyper-V virtualization technology. Not much is known about Black.Host’s origins, data centers, or location. But they do protect your privacy by never storing personal information and by ignoring all DMCA requests. Their “No Matter What” policy is also supportive of anonymous users and guarantees server uptime. Their offshore VPS servers are based in Russia, Sweden, and Switzerland. The following outlines Black.Host’s DMCA Ignored VPS hosting. Black.Host offers Windows 2003 Web, Windows 2003 Standard, and Windows 2008 OS licenses. The 2008 version is free while both Windows 2003 versions cost an extra $30 per month. Their prices are competitive, hard drives are equipped with SSD, and multiple server locations are available. We only wish they offered more storage and a stronger bandwidth connection. But overall, this is a reliable offshore Windows VPS provider who respects privacy. PanamaServer is an early adopter of the offshore hosting space, being established in 2004, this host maintains its own servers with their own network space and in-house technical support team. Each VPS comes with your choice of Windows XP, Windows 2003, or Windows 2008 operating system. Unfortunately, PanamaServer offers only 1 plan for each VPS solution, including their Windows VPS. Even by customizing a plan, PanamaServer does not currently allow Windows VPS servers to go over 2 GB of RAM and 40 GB of disk space, which just isn’t an option for larger websites. Luckily, they use the latest equipment and offer low prices for smaller users – getting set up with a Windows VPS costs just $20. Hosthink was founded in 2010 and appears to be headquartered in Turkey. Hosthink offers 3 different server types across 6 data center locations, which include Holland, Luxembourg, Switzerland, Italy, Bulgaria, Turkey, and USA. Server connection speeds range between 100 Mbps to 1 Gbps, fully burstable. Hosthink’s Windows VPS runs on KVM technology is only applicable with their Turkey location. While even though their prices are good, Hosthink doesn’t appear to be using the latest hardware, which would enable the fastest data connections possible. They also only include trial versions of Windows 2008 Server R2 and Windows 2012 Server OS. This offshore web host is another newcomer to the VPS hosting industry and has managed to quickly capture the attention of European users. BalkanVPS appears to be partnered with the Max Networks data center, which is based in the Republic of Kosovo – a disputed European territory landlocked in the central Balkan Peninsula. The Windows server license used by BalkanVPS is the Windows 2008 Standard edition, which is included in the total plan price. Their prices are competitive and additional memory and disk space can be added as needed. Their accepted payment methods include Bitcoin and Paypal, and by being based in a politically tumultuous region, you can confidently expect BalkanVPS to ignore any DMCA requests with respect to your privacy. DeltaHost uses 1 Gbps shared network ports. Available Windows OS server licenses include Windows Server 2016 Standard (64 bit), Windows Server 2012 R2 Standard (64 bit), Windows Server 2008 R2 Standard (64 bit), or Windows Server 2003 Standard (64 bit). Each VPS also comes with a free VestaCP panel. DeltaHost offers excellent prices considering the technology, storage space, bandwidth, and available Windows licenses given. InnovaHosting was formed in 2012 and maintains its servers in a data center located in the Republic of Moldova. They also leverage the power of SSD servers and provide free anti-DDoS protection at speeds of up to 500 Mbps. InnovaHosting’s available Windows OS versions include Windows 7 Ultimate (64 bit), Windows Server 2008 R2 (64 bit), and Windows Server 2008 (32 bit). There are several positive aspects that come with choosing InnovaHosting’s Windows VPS solution, which including: Pricing, allocated SSD space, unlimited bandwidth, and the fact they own their own data center. Established in 2011 and based in Ukraine, Netengi offers a variety of hosting solutions targeted primarily to a Russian and Ukrainian audience. Their offshore server locations include Russia, Ukraine, the US, and Netherlands. The following plans are part of Netengi’s Holland-based VPS servers. The Windows operating systems included with each offshore VPS are Windows Server 2008 R2 or Windows Server 2012 R2, free of charge. The company also ignores any and all DMCA notices and even allows video streaming and TOR services on their dedicated servers. All-in-all, Netengi respects your privacy, relies on their own equipment, and is an excellent low-cost Windows VPS solution. We highly recommend doing business with this offshore hosting provider in the future.